In my undergrad years (my idealist, wanderlust years as an English undergrad), I wrote a Shakespeare essay, analyzing the dichotomous relationship between “light” and “dark,” images or symbols in Shakespeare’s tragedies and how these opposing forces united, in a mysterious way, within Shakespeare’s tragedies to help show the complete, tragic subversion of things that were seen, from the outset of a play to be ideal and perfect. From the very beginning of Kazuo Ishiguro’s allegorical, layered fantasy story The Buried Giant, the writer wistfully describes a town that has certain key provincial features, giving the reader a relaxed, almost idyllic impression, until certain incidences of subversion of this idyllic atmosphere begin appearing within the first handful of pages. The first subversion occurs within the mind of the archetypal, aged hero, Axl, who is relaxing on a bench, yet disturbingly, dredges up memories that he vaguely recalls, but cannot be lucidly recounted,in a full-blown/recognizable form, within his mind, which he explains early on as being the result of a mist that shrouds the landscape of their town. Then, there is also an impenetrable darkness within the slightly isolated hovel of Axl and his princess, Beatrice because neither are lawfully allowed ownership of a candle, which further pitches the supposed preconceived notions of this story being a light fantasy tale into obliterating darkness. And the light that minutely comes back,in pieces, is our own active piecing together of certain disjointed, though loosely juxtaposed fragments of the various memories and stories that Axl and Beatrice, the two main leads of the story, encounter on a deceptively simple journey to reunite with their long-lost son, with whom they haven’t seen for many years. Their memories are mostly idealistic of him, as they barely remember as being nothing more than an honorable,respectable son. To recount all the details of the deep allegorical journey of the human psyche and the existential meaning of the simulacrums that crop up in this mesmerizing tale would likely ruin your experience with this story. It’s a book whose experience of reading is really hold to define or articulate completely with these words. In the tradition of Earthsea, it is a fantasy story that utilizes the proven technique of subtle writing, where the deeper meaning of the story must be discovered first-hand by the reader,or the observer of the seemingly fragmented, cryptic events that comprise the depth of this story. It is one that I sometimes became very discouraged with at times, not because the writing was poor, but because this is truly a literary work, and it is a serious endeavor to read, geared for the patient, scrupulous reader, willing to read closely and carefully, in order to elucidate the deeper messages of the story that are always artfully shrouded in a poetic fog. Interspersed in this fog are the aforementioned scenes of light, and we get glimpses into the scattered memories as they are recalled during certain scenes. For example in one sequence, a warrior recalls how he formed animosity for an opposing nation all due to something that occurred in his earlier life, breaking him off from a conditioned alliance with a specific culture he had been born into. This serves as an apt analogy of both the character’s active interaction and interpretation of the power of “their memories,” along with our own emergent understanding of just how all these unrelated memories, and uncanny sequences within the present frame of the story’s main action fit together, in a bizarrely congruent, coherent fashion. 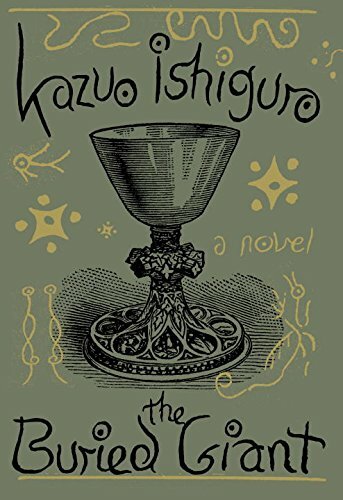 It is an ingenious, thoughtful, and strongly cerebral story, carrying certain messages and themes prevalent in all of Kazuo Ishiguro’s works. I was just thinking of that sobering scene, from Remains of the Day, towards the end, which silently bears the solemnity and tragic demise of a potential future for the two characters, who had developing feelings for one another. But the resigned silence, traditionally ingrained among English servants, is what inevitably led to a tragic demise of any potential romance between them. And only the fleeting, though sentimental, even cloying memories of certain events in the past, still lend some slight, though futile credence to the idea that in an entirely different world that it may have worked. Memory can be a very ruthless fiend at times, in that it sometimes unconsciously is reworked by the person, recounting certain things. And these memories spontaneously are remembered during certain crucial moments, where a familiar emotion at the center of a present conflict, might recall something from the past about that. When brought up to another person that may have remembered the event, it might cause bitter disagreement, as paradoxically, this memory was experienced and recollected differently by these two people. Sometimes, these memories could undermine any and all positive development between two allied or intimate persons/nations. Peace can be broken by a dredged-up resentment that had been long lost to the complacency of negotiated peace. Examples of the myriad number of effects of memories and how they affect the present are revealed in a fair number of scenes throughout this story, and they are what Kazuo Ishiguro has marvelously used in order to provide some cohesive fabric of a story. In the light of the present, there is always the antipathy of darkness belying the present-day happiness we naively hold onto for one day. That is the elusive, powerful mechanism of conscious existence and a strong force in the working of the mind and stories. It is something that The Buried Giant masterfully unravels, throughout 300 or so carefully-written pages, in a story that is very much an allegorical patchwork of different lives that are either enhanced or negatively impacted by the mysterious workings of memory. Aptly-named (and perfectly matched with The Buried Giant), Two Leaves and a Bud’s delicately-flavored Cloud Mist Green Tea derives its name from the fact that it is grown on the Lushan Mountain in China, up in the clouds and mist. In The Buried Giant, the giant that is buried happens to be an incredibly dangerous, seemingly undefeatable she-dragon,who is the one chiefly responsible for the mist that covers the Saxon and Briton lands, causing many of the denizens of both neighboring countries to have trouble recalling certain, long-forgotten memories of their respective elusive pasts. When preparing this tea, I used semi-boiling water (which should be precisely 175 degrees Fahrenheit, though I just estimated the temperature, based on the time it was boiled) and let the wiry, thin green-slightly grey hued dry tea leaves steep in the hot water, within my Glass Japanese tea pot, for exactly ten minutes or so. During that duration of time (which may be interminable for the impatient, restive tea-aholic), I observed that the small stems of tea began to bloom into large, perfectly-shaped green tea leaves. I immediately thought about their expansion as being analogous to the way that the journey of the various characters in this story, while painstaking from the outset and even cryptic as to its ultimate goal, slowly unravels long-forgotten memories that may either improve the journeys of these characters, or enfeeble them by forcing these characters to dredge up bitter feelings of either antipathy or forgotten resentment about a specific event that was never entirely dealt with in the past. Upon drinking this delicious, though rather strong,potent Green Tea (it is delicately flavored), I could taste hints of wheat-grass, clover, (as promised by the brew’s tantalizing description) and something entirely hard to decipher. After drinking several cups of it, I am still trying to guess as to the subliminal flavor that keeps eluding me. The certainty that I have that I know that my mind has holds knowledge of what this flavor is specifically, though its exact name cannot be remembered, again is comparable to the paradoxical nature of the way these characters at times stumble upon some vague reminders of remembered events, or familiar faces from the past, only to stymie their efforts with the impossibility of being able to clearly articulate just what that memory holds for them in the present. And when drinking this fantastic, rich-flavored tea that lingers in your mind for hours after sipping it, while carefully pondering the various layers of meaning in store within the pages of Kazuo Ishiguro’s allegorical fantasy book The Buried Giant, you will be trying to describe the flavor of the tea to the best of your ability, only to find yourself encumbered by the riddling madness that comes with trying to gather the words that come to mind to make up an all-encompassing description of this tea’s sublime, though mysterious flavor. This tea will both enrich your mind and your own reading of this riddling, though thought-provoking new novel from author Kazuo Ishiguro! Visit Two Leaves and a Bud’s description page for this tea, for more information, on how to purchase your own bag of this fantastic, high-quality tea, to accompany your pensive reading of Kazuo Ishiguro’s The Buried Giant!